For the wrecking crew, the “2018 MXA 450 Shootout” started back in May of 2017. A shootout is a fairly straightforward process with a few twists and turns along the way. The first step is getting a first look at what the manufacturers have in store. Normally, the press relations guys at each company slip us a password-dedicated address or thumb drive to see the high-resolution photos of the new bikes. This year we got the 2018 press intro photos as early as May of 2017. The second step is a tech briefing, where all of the media outlets are shown the bikes in person, along with a breakdown of every part that has been changed. How this happens varies with each company, but if everything falls in line, the tech briefing is followed by the first test ride. The first test day isn’t really a test day at all. It is actually a day devoted to photos, videos and making a few minor changes to suit our needs on that day. Depending on how new the 2018 bikes are, the manufacturers either swing for the fences with a fancy junket to a far-off track or they send out a mechanic with the bike to make sure that it lives through the first day. 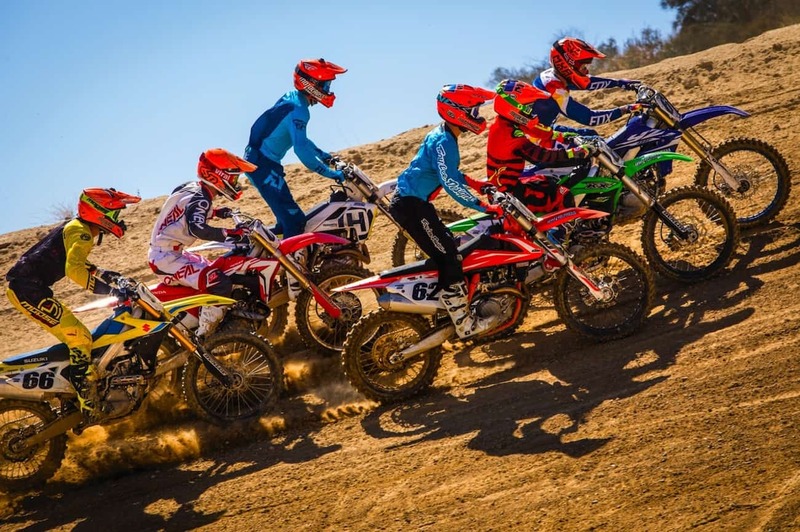 For the 2018 model year MXA did first-day tests at Zaca Station, Sunrise, Cahuilla Creek, Glen Helen and the JGR track in North Carolina. In our heart of hearts, we don’t want to leave SoCal for the first-day tests. As nice as it is to go to the JGR test track in North Carolina and get to see our old MXA compadre John Basher, we don’t want to test motorcycles 3000 miles away from our home base. There are many reasons we don’t like it, but, in the case of the 2018 Suzuki RM-Z450, we’ve been to the JGR facility lots of times, so it’s not a dream destination for us to go there for a first ride. SO WHILE HONDA, YAMAHA, SUZUKI, KAWASAKI, KTM AND HUSQVARNA LOVE TO SEND US TO FAR-OFF LOCALES TO RIDE THEIR NEW BIKES FOR THE FIRST TIME, WE DON’T WANT TO GO. So while Honda, Yamaha, Suzuki, Kawasaki, KTM and Husqvarna love to send us to far-off locales to ride their new bikes for the first time, we don’t want to go. We’ve been everywhere. We’ve done this dog-and-pony show in Austria, Sweden, Spain, the Canary Islands, Washougal, Monster Mountain, Budds Creek, Red Bud, Japan, Canada, Holland and Erzberg. We are jaded. (1) We are busy. Motorcycle magazines and their supporting websites don’t just come together overnight. They are planned with military precision. As MXA is finishing the January 2018 issue, we are already midway through the February issue’s tests and scheduling the March projects. 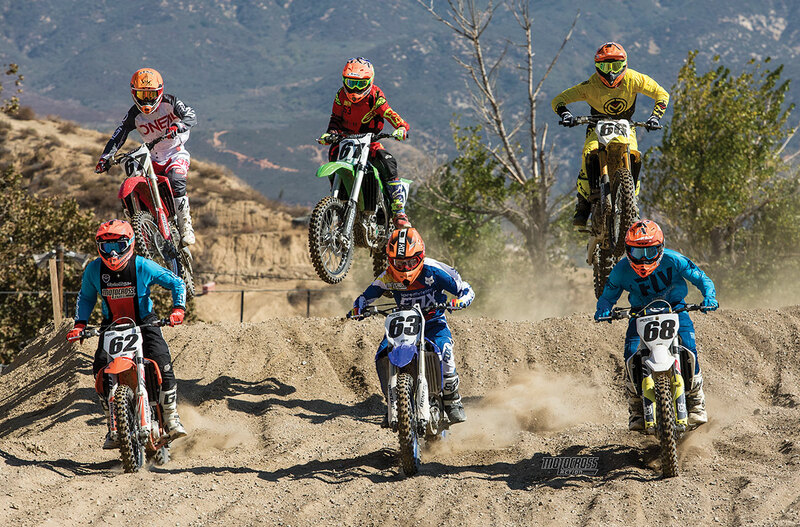 As much as we’d love to spend five days in Timbuktu riding next year’s bikes, we’d much rather spend five days riding next year’s bike at Pala, Zaca Station, Cahuilla Creek, Milestone and Glen Helen. (2) Even though it is fun to fly to Austria for a first-day ride, it isn’t much of a test. MXA prefers to test bikes on the “dirt dyno.” What is the dirt dyno? It is the tracks that we have done a thousand laps on, the tracks where we have ridden every model of bike, the tracks we know like the backs of our hands, and the tracks where we can tell fast from slow with our eyes closed. That isn’t a track with a lovely ocean view on an island off the coast of Africa. 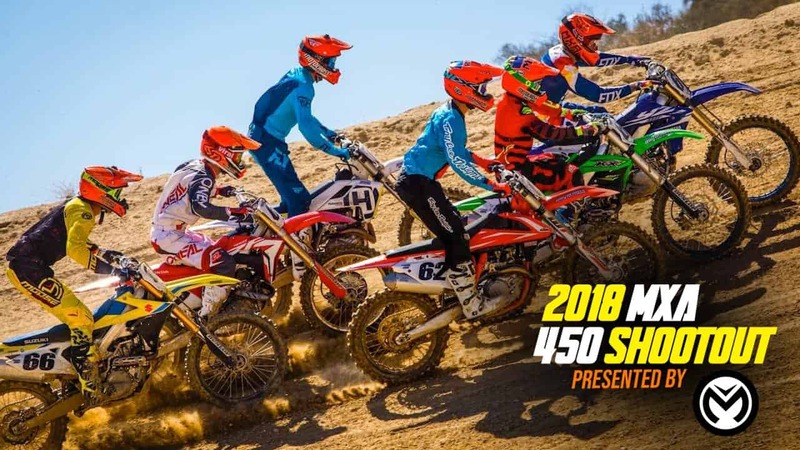 (3) You might have noticed that MXA’s 2018 450 shootout is the last 450 shootout done by the media. Every other magazine has already printed its 450 shootouts. Why are we last? Because we didn’t know enough about the 2018 bikes to be first. We take our time. We shot the video for the Shootout early on, but we didn’t do the voice-over, preferring to wait to add the soundtrack later in the process. From that point on we raced each bike week in and week out for months. Unlike most magazines’ shootouts, which are done over a couple of days (if even that), we do ours by living with the bikes for months. 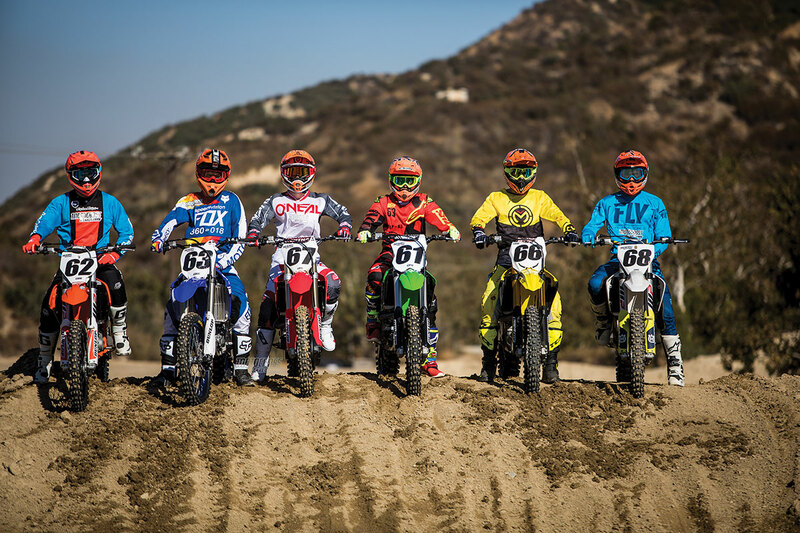 We want to take all the time we need to learn to love, hate or be mystified by all six bikes in the 2018 MXA 450 shootout. THE PR GUYS HAVE A TOUGH AND DELICATE JOB. THEY ARE HIRED BY THE MANUFACTURER TO SPIN NEXT YEAR’S BIKE INTO A UNICORN REGARDLESS OF HOW GOOD OR BAD IT IS. During the course of the six individual 450 tests and the shootout, we form a bond with the press relations guy assigned to cater to our every want and whim. MXA knows a lot about press relations guys, especially since several former MXA editors have become press guys at the “Big Six.” The press relations guys we work with are made up of a mix of former factory mechanics, AMA Pros, magazine test riders and the occasional district sales managers. The PR guys have a tough job. They are required to spin next year’s bike into a unicorn regardless of how good or bad it is. And, regardless of what goes wrong, a press relations guy has to grit his teeth and smile. In truth, not even an army of press relations guys can make up for a bad bike. That doesn’t mean that bad bikes don’t get good reviews, as there are occasional cases of testers favoring their wallets over common sense, but these instances are always exposed over time. Good wins out over bad, just like in every John Wayne movie that has the word “Rio” in the title, because every buyer of a 2018 bike has the final say. He is his own personal test rider. Don’t think that we thrash our test bikes. We treat them with loving care, new parts, new tires and regular maintenance. Plus, the public relations guys, especially those who were factory mechanics in their previous lives, will jump in to go over our test bikes whenever they are sitting still in the pits. We are compelled to take care of our 2018 test bikes because we use them for individual tests, shootouts, how-tos, product tests and all manner of informational articles about that particular model. Thus, MXA keeps its test bikes stock. We don’t re-valve the forks or shock, unless it’s trying to kill us. We don’t race with aftermarket exhausts, unless we are testing that pipe for another article (and it comes off the bike as soon as the pipe test is done). We do, however, make changes to any problem area that must be addressed for the good of the bike or well-being of the test riders. 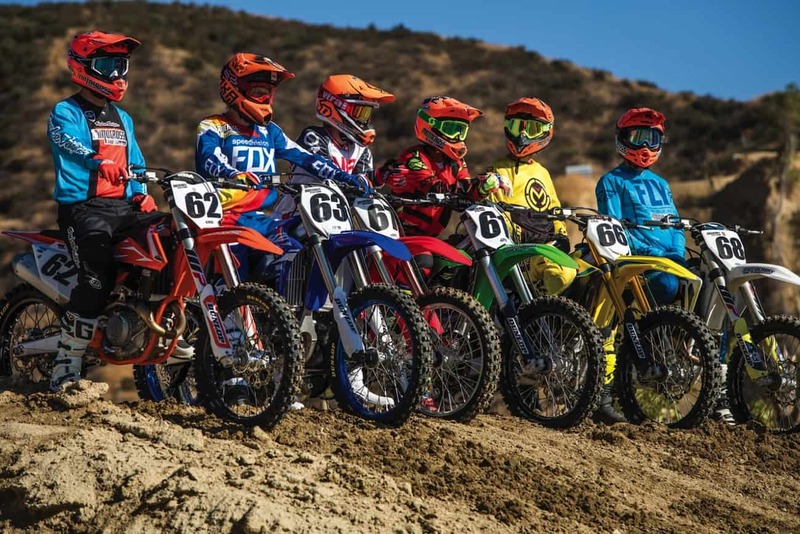 MXA will change the gearing, add stiffer clutch springs, increase or decrease spring rates, raise or lower oil heights, remap the engine (without changing black boxes) and change bars if the majority of test riders agree on a different bend. For 2018 we remapped the Yamaha YZ450F and Kawasaki KX450F; put stiffer clutch springs in the KX450F, Suzuki RM-Z450 and Honda CRF450; raised the fork-oil height on the RM-Z450; put lower bar mounts on the YZ450F; added a higher-pressure radiator cap to the CRF450; ran a longer shock link on the RM-Z450; updated the KX450F chain guide to a TM Designworks chain guide; put a Husqvarna FC250 muffler on the FC450 to get rid of the restrictive ice-cream-cone baffles; and changed the gearing on virtually every bike to suit the tastes of test riders or the demands of the tracks. THERE IS A LOT OF POPPYCOCK FLOATING AROUND ABOUT THE VALUE OF SHOOTOUTS. BACKYARD EXPERTS LOVE TO PONTIFICATE ON HOW MEANINGLESS IT IS TO READ A SHOOTOUT. There is a lot of poppycock floating around about the value of shootouts. Backyard experts who have never raced any of the 2018 bikes, let alone all six, love to pontificate on how meaningless it is to read a shootout. They have a wide variety of arguments to prove their point, most of which don’t make a lot of sense. Here are their reasons why. “All bikes are the same. 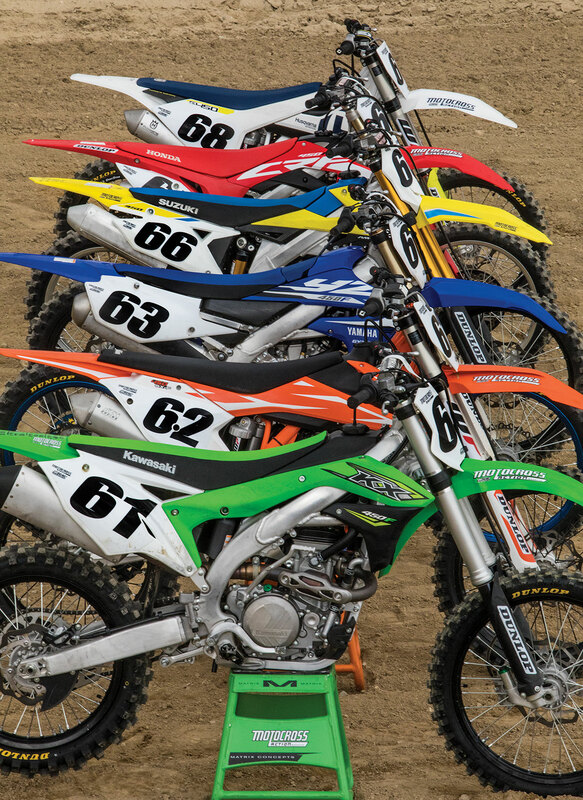 Just choose the color you like.” We can promise you that not one of the six bikes in the 2018 MXA 450 shootout is remotely similar to any other bike in the shootout—and that includes the two that roll down the same assembly line in Austria. Oh, we’ll give you that they all have handlebars, engines, forks and wheels, but that’s where the similarities end. Suffice it to say that a 2018 Suzuki RM-Z450 isn’t from the same gene pool as the KTM 450SXF. Nor is a Yamaha YZ450F the blood brother of a Kawasaki KX450F, and so on through the color spectrum. “Shootouts are just the opinion of a bunch of people, and what they like isn’t necessarily what you’ll like.” That is true, but how do you know what a particular bike is like until you read about it? Are the six friendly local dealers in your town going to give you brand-new 2018 bikes to ride so you can form your own opinion before plunking down the cash? Didn’t think so. Thus, the ability to learn which one hits hard and signs off early versus which one rolls on smoothly and doesn’t jerk you around is opinion that you can use. You can put those opinions in the bank—before you go to the bank to spend $9000. Believe it or not, the MXA test riders who raced every bike in the 2018 MXA 450 shootout over the last six months didn’t all choose the shootout winner as their personal race bike, but based on racing each bike, they knew what trade-offs they were making to get the traits that best suited their styles. “Shootouts are won by the advertiser that spends the most money in the magazine.” You have to be kidding. MXA couldn’t pay for the gasoline it uses testing bikes with the money the Big Six spend buying ads. Perhaps you missed the news about the 2008–2014 economic recession that cut motorcycle sales in half—and the ad budgets for motocross bikes by double that. MXA’s biggest advertisers are companies that make gear, exhaust pipes, graphics, aftermarket parts, chains, grips and boots. The MXA test riders don’t sell ads, don’t know what they cost and don’t have a clue about the advertising schedules of Honda, Suzuki, KTM, Kawasaki, Husqvarna or Yamaha. Need some perspective? 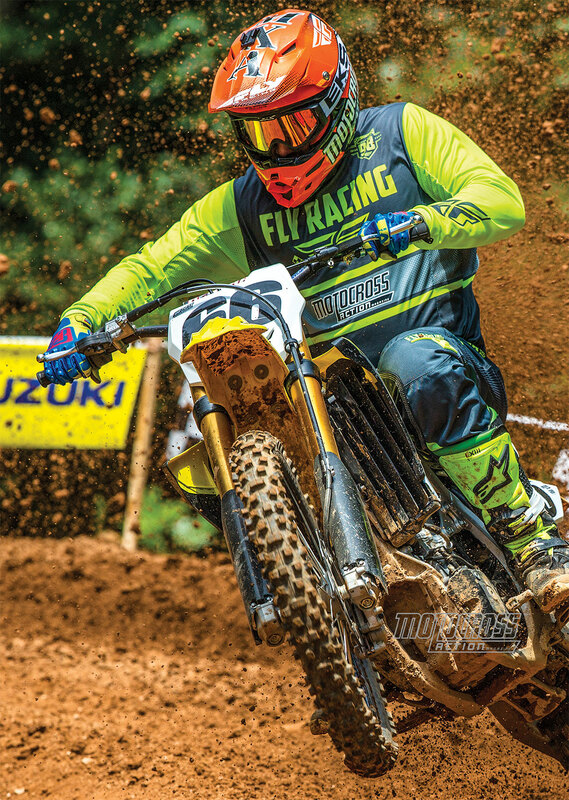 The number of ad pages bought by all six motorcycle manufacturers combined in the average monthly issue of MXA is one-half of the ad pages that Decal Works has in every issue. EVERY MANUFACTURER HAS A FULL-BLOWN TEST DEPARTMENT THAT KNOWS, IN GREAT DETAIL, THE FLAWS OF ITS OWN MACHINES AND THE HIGHLIGHTS OF THEIR COMPETITION. It is inevitable that whatever bike a magazine chooses as the winner, someone is going to be unhappy. Actually, lots of people are going to be unhappy. First on that list are the racers who maxed out their credit cards to buy the bike that finished last. Next come the dealers who sell the brands that didn’t get good reviews. Finally, there are the manufacturers who lost. You might have thought that the factories would be number one on the unhappy hit parade, but that isn’t true. They wanted to win. They hoped to win. But, every manufacturer has a full-blown test department that knows, in great detail, the flaws of its own machines and the highlights of its competition. They have scales, dynos, computers and test riders who know good from bad, thus there was nobody at Kawasaki who thought that not changing the 2017 KX450F for 2018 was going to move them up in the shootout rankings. They knew they were going down in the hierarchy of 2018 450 motocross bikes. (1) Potential buyers. Eventually, every motorcycle racer needs a new bike to replace Old Betsy. The smartest of these riders want to investigate every bike out there before they plunk down the major cash that they earned in a corporate sweat shop. (2) The nay-sayers. These people already bought a 2018 bike and are looking for confirmation that the bike they bought is as good as they think it is. After all, they invested $9000 in the decision-making process. They rue the day that they find out that their super-expensive new purchase didn’t score well. (3) The disgruntled. There are people who love to read bad things about the bikes they don’t own. It is strange, but they peruse every 2018 shootout, selectively reading about bikes they don’t like with a gleam in their eyes. These readers neither own nor plan to buy that brand; they are just like looky-loos, slowing down traffic so they can gawk at an accident in the right lane. There are six machines in contention for the 2018 MXA 450 shootout: the Honda CRF450, Kawasaki KX450F, KTM 450SXF, Yamaha YZ450F, Husqvarna FC450 and Suzuki RM-Z450. You can rest assured that one of these six bikes is going to win and the other five will lose; however, the MXA wrecking crew doesn’t look at it that way. 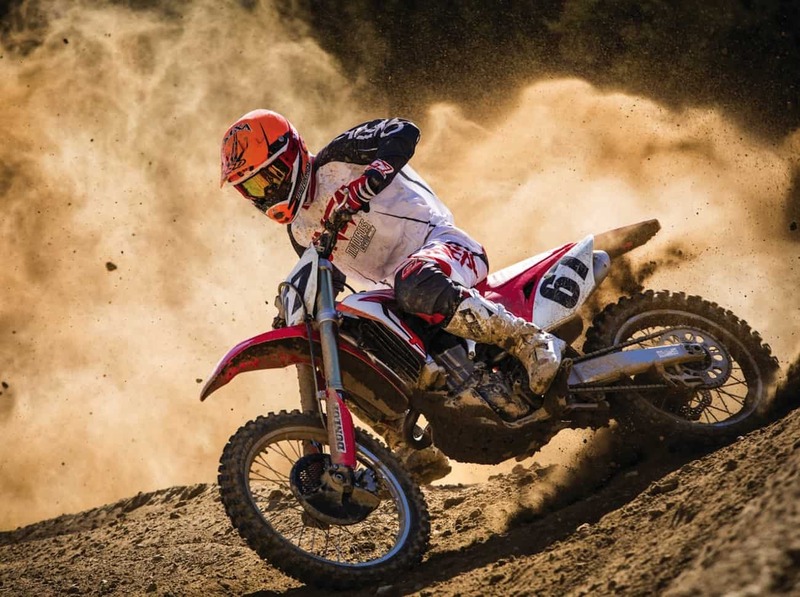 While we may anoint one bike as the best of the year, the five bikes that don’t win have their own allurements‚ advantages and benefits that could outweigh the MXA wrecking crew’s fairly straightforward evaluation of racing performance. Make no mistake about it; we aren’t looking at these six bikes for their play riding, enduro, offroad or professional practice-riding prowess. To us, these are purebred race bikes, and that’s how we test them. Our choice is just a suggestion. Potential buyers should look at all of the factors before throwing their plastic money on the counter. There are a lot of qualities that could make the worst bike in our comparison the best bike for you, although we highly doubt it. IF YOU READ A SHOOTOUT WHERE THE 2018 KTM 450SXF DIDN’T WIN, YOU JUST WASTED YOUR TIME READING THE RESULTS OF A SERIOUSLY FLAWED EVALUATION SYSTEM. FIRST PLACE: 2018 KTM 450SXF. If you read a shootout where the 2018 KTM 450SXF didn’t win, you just wasted your time reading the results of a seriously flawed evaluation system. Not even in the Fifth Dimension of Mister Mxyzptlk is there a machine that offers as many pluses and as few minuses as the 2018 KTM 450SXF. Think about it for a split second—you don’t need to muse over it for very long. But, if you draw a blank, here are the top-10 highlights of the 2018 KTM 450SXF. (1) Clutch. The 450SXF clutch is not just any clutch. It is a Belleville washer-activated, hydraulically powered, diaphragm clutch that is built around a CNC-machined steel basket (the primary gear machined in). It self-adjusts, and the clutch plates last forever compared to Japanese clutches. (2) Brakes. If you’ve never raced with KTM brakes, be forewarned that they will stop you in your tracks if you pull on them the way you grab your KX450F, YZ450F, CRF450 or RM-Z450 brakes. They are universally acclaimed and phenomenally easy to use. (3) Powerband. 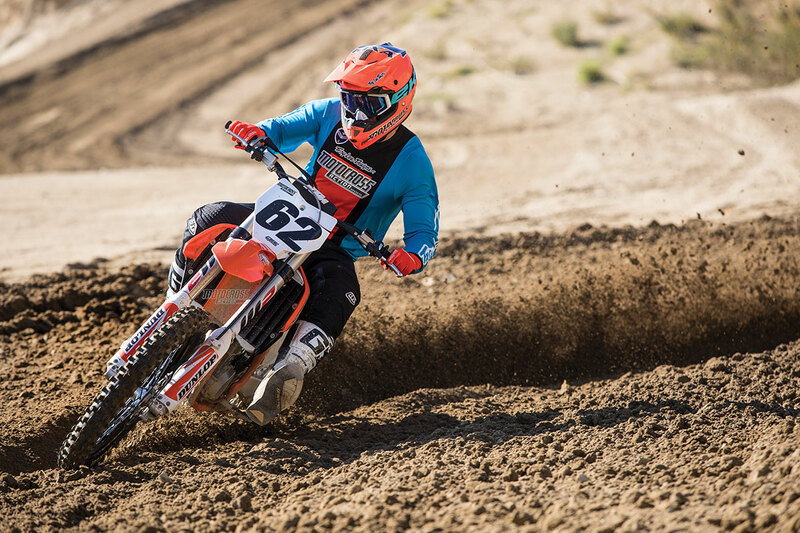 The KTM 450SXF’s power pulls longer than any other engine on the track. It is ultra-manageable at low rpm and blazing fast as the power climbs. It is the only engine that meters out the power so that it is more usable over a longer time frame. (4) Weight. The KTM 450SXF isn’t just lighter than all four Japanese-built 450s; it is lighter than half of the 250s. How much lighter? The KTM is 19 pounds lighter than the RM-Z450, 18 pounds lighter than the CRF450, 17 pounds lighter than the YZ450F and 9 pounds lighter than the KX450F. Don’t let anybody tell you that weight doesn’t matter on motocross bikes, because that goes against the wisdom of 50 years of motocross racing technology. (5) Handling. 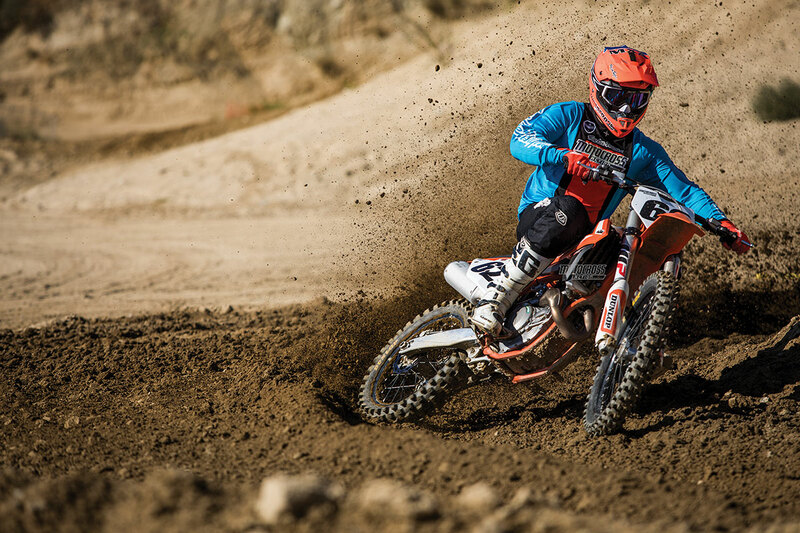 The MXA wrecking crew loves the neutral handling of KTM’s chromoly steel chassis. It is the best all-around-handling bike on the track. You just have to think about a line and it takes it. Best of all, it isn’t a one-trick pony that gives up 75 percent of its handling to do one thing well. The KTM does it all. It is super sharp at turn-in, accurate as a laser from center out and as stable as they come down a rough straight. (6) Shifting. Of all the bikes on the showroom floors in 2018, the KTM shifts the best. There are no sticking gears, false neutrals or missed upshifts. It grabs gears, and as a plus doesn’t need to be shifted as often as the average bike thanks to the broad powerband. (7) Forks. KTM’s AER air forks are better than all the other forks on the market save for the fabled Kayaba SSS forks on the YZ450F. Not only are they easily adjusted; they work well for riders from 130 pounds to 230 pounds. Set the air pressure once and turn the compression clicker to make the adjustments. Plus, they are 3 pounds lighter than any coil-spring fork. (8) Electronics. The KTM 450SXF has an electronics suite on the left side of the handlebars. It features two ECU maps, traction control and launch control at the push of a button. (9) Accoutrements. 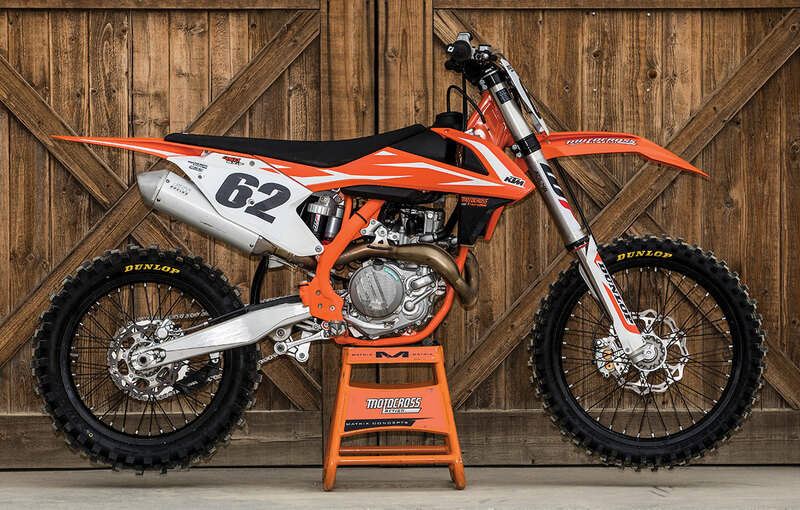 The KTM 450SXF has quick-release fuel lines, rubber-mounted bars, plastic frame guards, direct-connect throttle cables, a mud-free shift lever, lock-on grips, folding levers, big footpegs, in-mold graphics and a stock hour meter. (10) Airbox. You don’t need to remove the seat to get to the KTM air filter. It doesn’t use thumb screws or wingnuts to hold it in place. The air filter can’t be put in the airbox wrong, and you don’t need tools to change it. Why does the 2018 KTM win the 2018 MXA 450 shootout? It is the bike with the lightest weight, broadest powerband, incredible brakes, great suspension, hydraulic clutch, electric starting, easily accessible airbox, push-button-activated maps, steel clutch basket, effective launch control, perfect shifting, on-demand traction control and thought-control handling. It is the best bike by leaps and bounds. IT IS POSSIBLE FOR TWO MACHINES TO TIE IN AN MXA SHOOTOUT, BUT THE CRITERIA THEY MUST MEET IS THAT THEY HAVE TO BE DIAMETRICALLY OPPOSED TO EACH OTHER IN POWER, HANDLING AND SUSPENSION. 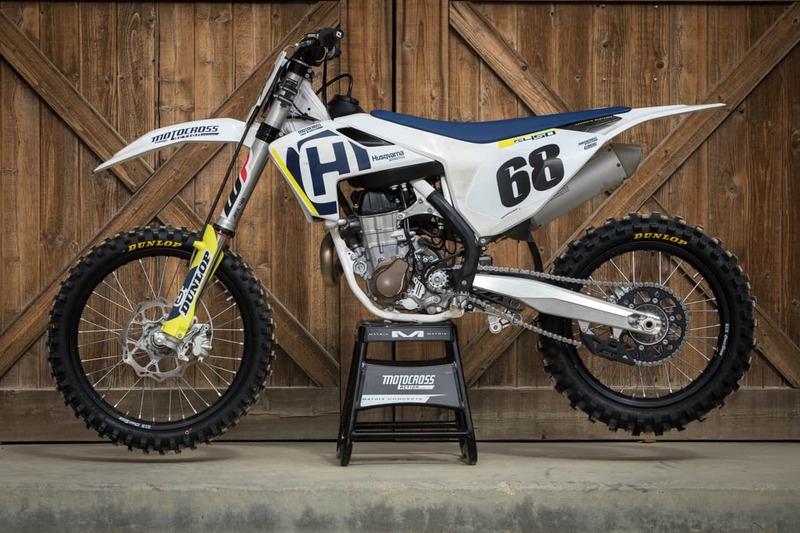 SECOND PLACE (TIE): 2018 HUSQVARNA FC450. It is possible for two machines to tie in an MXA shootout, but the criteria they must meet is that they have to be diametrically opposed to each other in power, handling and suspension. Paradoxically, two bikes cannot tie for the affection of the same potential buyer. In order to be considered equal, they must be unequal. This requires a set of circumstances that brings an inferior bike up to a higher standard and, conversely, a superior machine down to a lower benchmark. And that is where we find the 2018 Honda CRF450 and the 2018 Husqvarna FC450. Not for a second do we believe that they are equals, but we do believe that they can serve different masters. It’s up to you to wield the whip. Base bikes. Almost everything on the must-have list favors the Husqvarna FC450; it is the Daffy to the Dizzy Dean that is the KTM 450SXF. Dizzy Dean was one of the greatest pitchers in baseball history, and his brother Daffy was on his way to being Dizzy’s equal until he was injured. The FC450 has the exact same brakes, suspension, handling, shifting, electronics and accessories as the KTM. Where it differs is in its power delivery, clutch actuation, chassis resilience and a slight weight gain. The 2018 Honda CRF450 is little more than the 2017 CRF450 with stiffer springs, new mapping and electric starting. Those three changes are an odd mix (MXA ran all these changes on our 2017 CRF450). The new CRF450 map helped the engine run cleaner throughout its powerband. 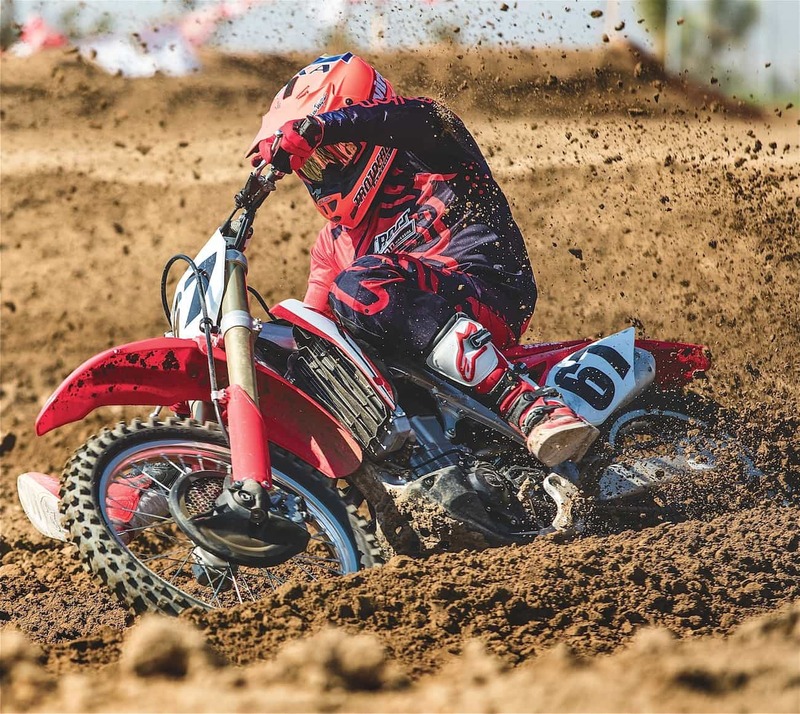 The stiff fork and shock springs helped hold the 2018 CRF higher in its stroke, while the electric starter eliminated kicking. Weight. The 2018 Honda is heavier than it was in 2017. How much heavier? The stouter springs and electric starter add 7 pounds. 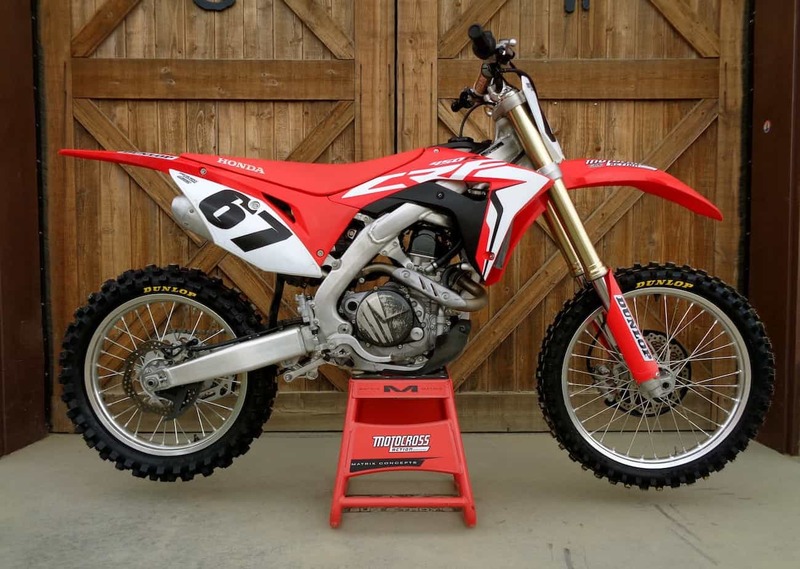 At 240 pounds, the CRF450 is the second-heaviest bike on the track. The Husqvarna FC450 weighs 224 pounds (16 pounds less than the Honda). Clutch. No contest. Husqvarna’s self-adjusting, hydraulic clutch is almost bulletproof. We say “almost,” because the seal in the Magura clutch slave unit is suspect when it comes to reliability. The Magura faux pas may be a black mark on the FC450’s clutch, but almost everything on the CRF450 clutch is a bummer. The Honda clutch is marginal at best. It is a seven-plate clutch equipped with a disgraced judder-spring system—and until you replace the judder-spring system with an additional plate, you will suffer broken clutch plates. Brakes. Honda’s brakes are still living in the glory days of O’Mara, Bailey and Dymond. The world has moved on—well, at least the world that knows how great Brembo brakes are. The Husky has Brembos that stop instantly. The Honda has Nissin brakes that think about it for awhile and then grab. Forks. Everybody thinks that switching from air forks to coil-spring forks is the magic elixir. It isn’t. The 2018 Honda CRF450 coil-spring forks chatter in the braking bumps and dive excessively in big hits. They are both too stiff and too soft. The CRF450 Showa forks are no match for the Kayaba SSS forks on the Yamaha or the versatility of the WP AER air forks on the Husqvarna FC450. They are copies of Showa A-kit forks—from 2010. Electronics. The 2018 Husqvarna FC450 comes with two ECU maps (stock and aggressive), traction control and launch control (all accessed via a handlebar-mounted multi-switch). The 2018 Honda CRF450 has three maps (stock, mellow and aggressive), but every test rider stuck with the stock map. The CRF450 does not have traction control or launch control. You don’t need to be Sherlock Holmes’ smarter brother to realize that the Husqvarna outshines the Honda in the weight, clutch, brakes, forks and electronics categories (to which we could add shifting, airbox design, cooling, frame rigidity and airflow). If you are wondering how we could possibly consider these two bikes to be a tie for second overall in the 2018 MXA 450 shootout, you need to cool your jets. We are getting there. Powerband. The 2018 Husqvarna has a very broad, easy-to-use and mellow powerband. Oh, don’t get us wrong; it makes a lot of horsepower across a really wide range, but it does it in a metered, calculated and metronome manner. 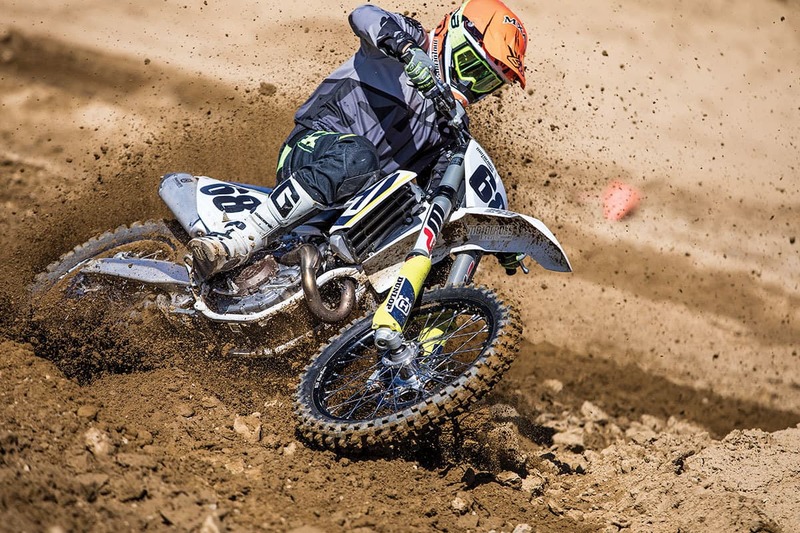 If you are of the opinion that the typical 450cc motocross bike is a romping, stomping beast, the Husqvarna will convince you otherwise. It’s easy to carve through turns, select lines in switchbacks or get the bike to go where you want it to go when the power is your friend. It should be noted that a Husqvarna FC450 owner can turn his mellow engine into an identical KTM 450SXF engine by drilling holes in the airbox and replacing the baffled muffler with the free-flow KTM muffler (or any aftermarket slip-on). The 2018 Honda CRF450 powerband is more exciting. It hits harder and sooner, with the payoff being a great midrange pull. Thanks to the new black-box map (there are no other mechanical changes between 2017 and 2018), the CRF450 has a better transition of power from low to mid. Last year’s herky-jerky low-to-mid power hasn’t been eliminated, and when the CRF450 comes on in the midrange, it is at its best. Compared to the FC450 powerband, the CRF450’s powerband is fun to ride. Both bikes are more than fast enough, with only the tiniest difference in peak horsepower, but the Husky is a smooth lap-time engine while the Honda has a gun-and-run powerband. Handling. These two machines are the Mutt and Jeff of motocross bikes when it comes to handling. How so? The Husky’s chromoly chassis is forgiving, super accurate and absorbent. Even when compared to the identical frame geometry of the KTM 450SXF, the Husky is softer-feeling. It is the most comfortable frame to hammer through whoops on, bend the frame through tight corners with or just lean into when slicing through switchbacks. The Husqvarna doesn’t have a single outstanding handling trait, because the whole package is outstanding. The Honda’s Delta-Box aluminum frame is, as it always has been, on the stiff side of the equation when it comes to resilience. The rigidity works the rider over more in the rough, but produces a cut-and-thrust style of handling. Its best trait is at turn-in, where it can knife into any inside line. Its quickness, combined with its explosive power, makes it a scalpel in the hands of a rider who is a surgeon at juggling understeer on the exit. It’s a fun bike to ride, largely because it has some joy-ride aspects to it. Depending on what you want out of your bike, you can get it with either the 2018 Honda CRF450 or the Husqvarna FC450; you just can’t get everything in the same bike—unless you buy a KTM 450SXF. A PODIUM ONLY HAS THREE STEPS FOR A REASON; IT IS CONFIGURED THIS WAY TO REWARD EXCELLENCE. A GOLD MEDAL FOR THE WINNER, A SILVER MEDAL FOR SECOND AND A BRONZE MEDAL FOR THIRD. WHO WOULD WANT A TIN MEDAL FOR FOURTH? 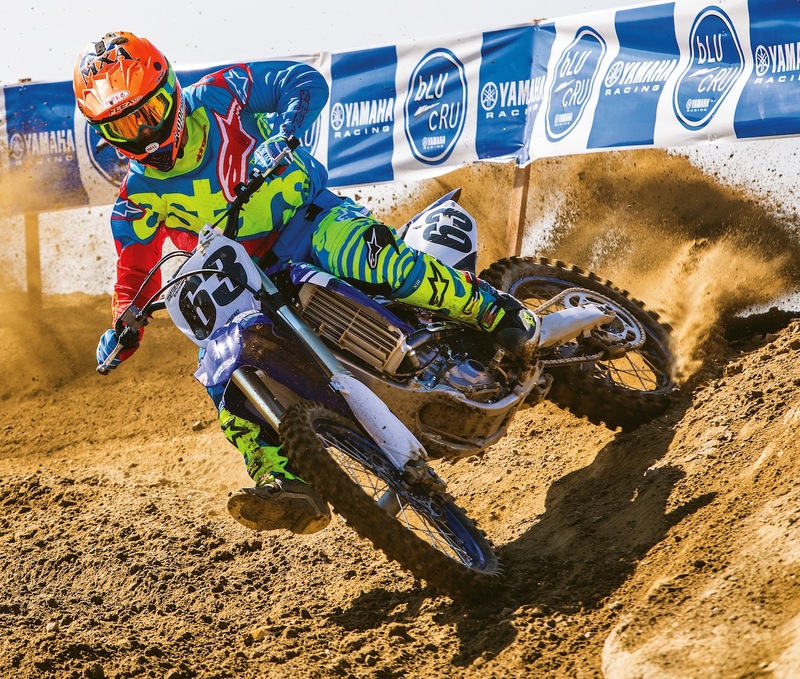 FOURTH PLACE: 2018 YAMAHA YZ450F. A podium only has three steps for a reason; it is configured this way to reward excellence. A gold medal for the winner, a silver medal for second and a bronze medal for third. Who would want a tin medal for fourth? But, somebody has to be fourth. In 2018 that is the Yamaha YZ450F (and even that wasn’t a sure thing). 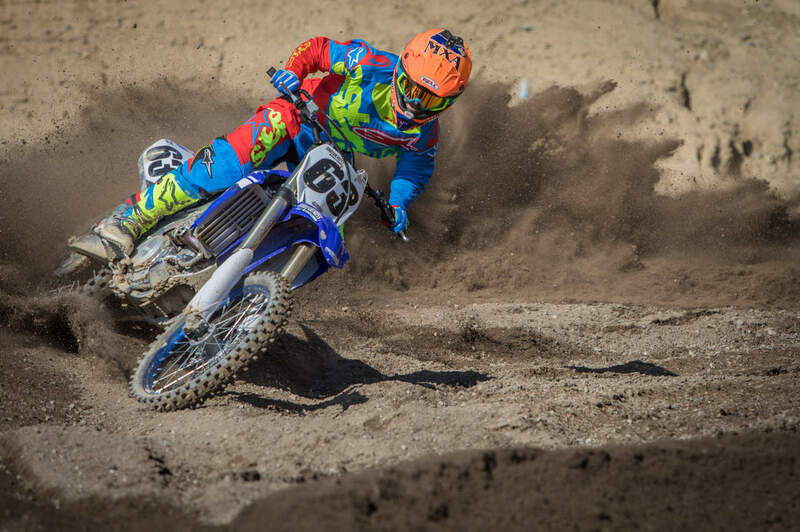 Every MXA test rider went back and forth between the 2018 Yamaha YZ450F and the 2018 (nee 2017) Kawasaki KX450F for fourth spot in the shootout. It wasn’t exactly a moral dilemma, but there were elements of the decision that tested our resolve in choosing the Yamaha over the Kawasaki. 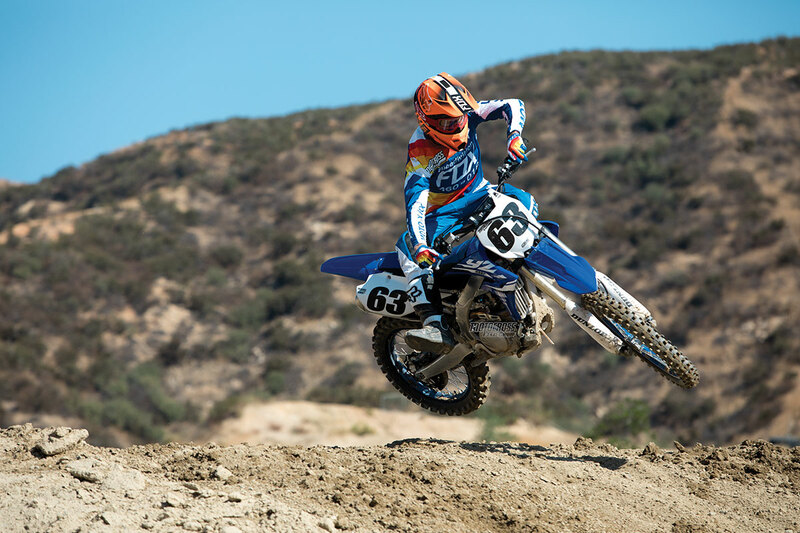 Perhaps no bike in this shootout split the MXA wrecking crew as much as the Yamaha YZ450F. 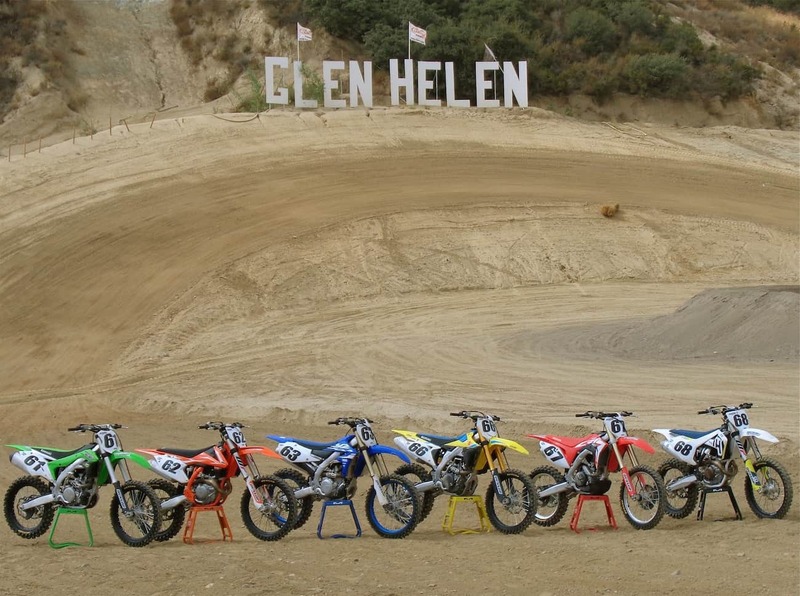 There is no reason to gloss over it; half of the MXA test riders hated the bike, while the other half loved it. It should be noted that none of them thought that it was better than the KTM 450SXF, but it jumped up and down on the MXA rankings based on one factor, whether or not the test rider was a Yamaha fan. Every MXA test rider who cringed at the memory of the last four years of jumbo-sized, poor-turning, two-stage powerband YZ450Fs found some aspects that they disliked in the 2018 model. 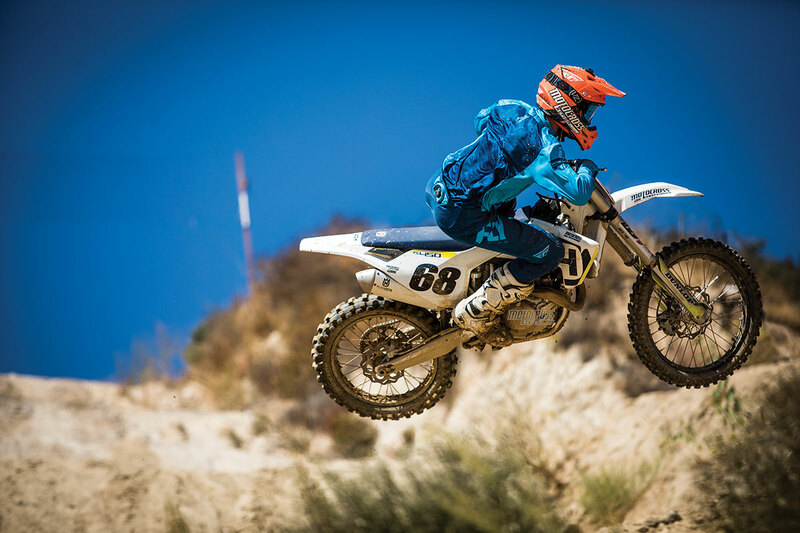 Conversely, riders who got along with the 2014–2017 YZ450Fs while recognizing the 2018’s flaws thought that the 2018 YZ450F was a massive improvement. And, overall, we think that Yamaha’s engineers did a great job of addressing a lot of the YZ450F’s previous ills. It does have a better powerband, and it is slimmer and narrower. The airbox is easier to access. It performs better than any previous Yamaha at turn-in. It is equipped with an electric starter. And, if you are looking for a YZ450F superlative, look no further than its Kayaba SSS coil-spring forks. These are aspects that every Yamaha-loving test rider loved, as well as MXA test riders who had been jaded by previous Yamaha failings. Those are the good things—but in getting some of those good things, the YZ450F became a victim of the law of unintended consequences. For example, no Yamaha YZ450F in recent history has been able to turn in to a corner with any accuracy. Instead, the YZ-F front end would wander, wiggle or wag. Not so with the 2018 Yamaha YZ450F. Its best trait is at tip-in. What the 2017 and every YZ450F before it couldn’t do, the 2018 YZ450F can. It is super accurate at turn-in. Finally, a Yamaha racer can hit an inside line more than two times out of 10. 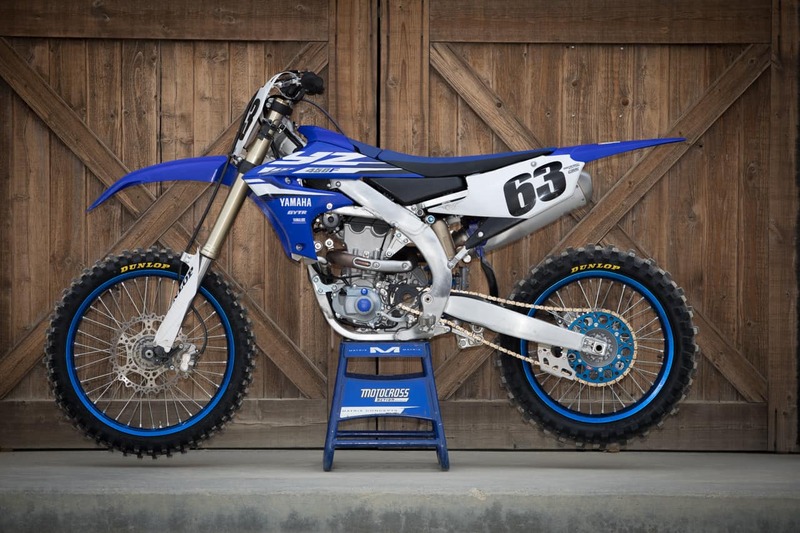 That single superlative will make every long-suffering Yamaha YZ450F owner love this bike. But, the law of unintended consequences kicks in after turn-in, when the 2018 feels very loose on the exit and blasphemously twitchy at speed. Who would have thought that if you focused all of your R&D attention on turn-in that the bike would become less stable at speed? Actually, every frame designer in the world would. Need another example? In order to appear as though they are keeping up with KTM, both Honda and Yamaha added electric starters for 2018. We love pressing a button to fire up the engine, but instead of losing 4 pounds with their new bike, Yamaha added 1 pound to a bike that was already too heavy. Thus, Yamaha invested in a new engine, new chassis, new bodywork and new airbox only to end up at 239 pounds. There is no doubt that Honda, Yamaha and Suzuki need to reset their priorities. They aren’t competing against each other to build the heaviest bikes possible. They should be competing against KTM to build the lightest. The 2018 Yamaha did achieve some superb heights with the all-new 2018 YZ450F. Here is the list. (1) Airbox. Yamaha rethought its airbox design and drop-kicked the plumbing nightmare it had before. Not only is the bike skinnier, but the 2018 airbox only has one Dzus fastener instead of three, and air volume is increased by 29 percent. (2) Suspension. Yamaha singlehandedly wiped Showa and Kayaba air forks off the face of the earth with SSS, except on the KX450F. SSS is still the best coil-spring fork in the biz. Only KTM’s WP AER forks are on the same playing field. (3) Mapping. After you download the Yamaha app, you can remap your 2018 YZ450F with your iPhone. That’s a good thing, because the stock map isn’t very good. We run the “Preston map” and a 49-tooth rear sprocket. (4) Seat height. The seat height has been reduced by 8mm in the middle, although for some strange reason Yamaha raised the handlebars by 5mm. We run last year’s bar mounts to bring them back down. (5) Powerband. Once on the track, it is obvious that the 2018 Yamaha YZ450F engine is significantly better than the 2017 engine. The 2017 Yamaha YZ450F engine had an abrupt hit and then laid down from 6000 rpm to 7000 rpm before taking off like a missile to its high-rpm peak. Most test riders hated the two-stage 2017 Yamaha YZ450F powerband. It lifted the front wheel on the exit of turns and forced the bike to the outside. The 2018 YZ450F powerband fills in last year’s dip. The result is one, long, usable, filled-in powerband. It doesn’t make much more horsepower than last year, but it now has one powerband. The 2018 YZ450F is fourth in the 2018 MXA 450 shootout because it is a better YZ450F, while being worse at the same time. We’re sure that Yamaha’s engineers didn’t intend that. THERE ARE TIMES WHEN BUDGETS, PRODUCTION SCHEDULES AND MANAGEMENT DECISIONS FORCE A MANUFACTURER TO STAND PAT—WITH THE FULL UNDERSTANDING THAT IF THEY DON’T IMPROVE THIS YEAR’S BIKE OVER LAST YEAR’S BIKE, THEY AREN’T GOING UP IN THE SHOOTOUT RANKINGS. FIFTH PLACE: 2018 KAWASAKI KX450F. There are times when budgets, production schedules and management decisions force a manufacturer to stand pat—with the full understanding that if they don’t improve this year’s bike over last year’s bike, they aren’t going up in the shootout rankings. Kawasaki dropped two spots in MXA’s 450 rankings from the 2017 shootout to the 2018 shootout. They knew what was going to happen, but they had no choice. The Kawasaki pencil-pushers didn’t want to spend money on the 2018 KX450F because there probably will be a new 2019 KX450F soon. All the R&D work was diverted from improving this generation of the KX450F and focused on the next generation. 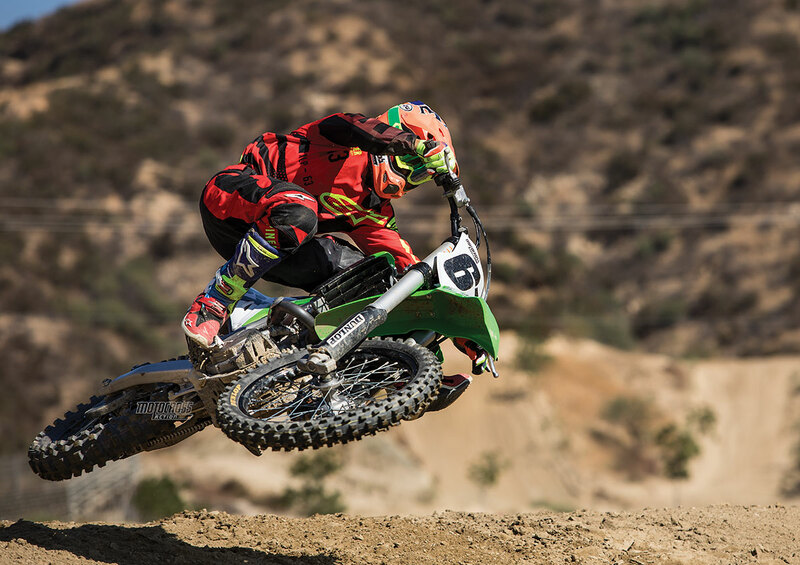 The sad thing, especially for the MXA wrecking crew, is that we like the current KX450F. We don’t like it because it’s the lightest, fastest or best-handling bike on the track. It isn’t. Instead, it is a good all-around race bike with very few flaws—and lots of good traits. The problem for Kawasaki isn’t that its bike is no good; it’s that it is boring. It has no pizzazz. No buzz, evidenced by the fact that Eli Tomac’s wins couldn’t keep it off life support. Kawasaki is going to have trouble finding buyers for a bike that is steady, predictable and has a good personality. That just sounds like a bad blind date. If we liked it so much, then why are we placing it fifth in the shootout? Four reasons. (1) It’s not fast. It doesn’t make much in the way of horsepower. It doesn’t have any significant top-end power. On the good side of the ledger, the 2018 Kawasaki KX450F powerband is supremely usable, very linear, mellow to the max and never scary. It gives up 2.5 horsepower to the Honda, KTM and Husqvarna, and when you consider that the KX450F isn’t good above 8800 rpm, there is no incentive to rev it. Still, the MXA test riders like the KX450F engine. It is a solid midrange engine that puts all it has into the ground. In fact, the KX450F makes more horsepower in the midrange than any other 2018 bike—just don’t rev it past nine grand. (2) Forks. 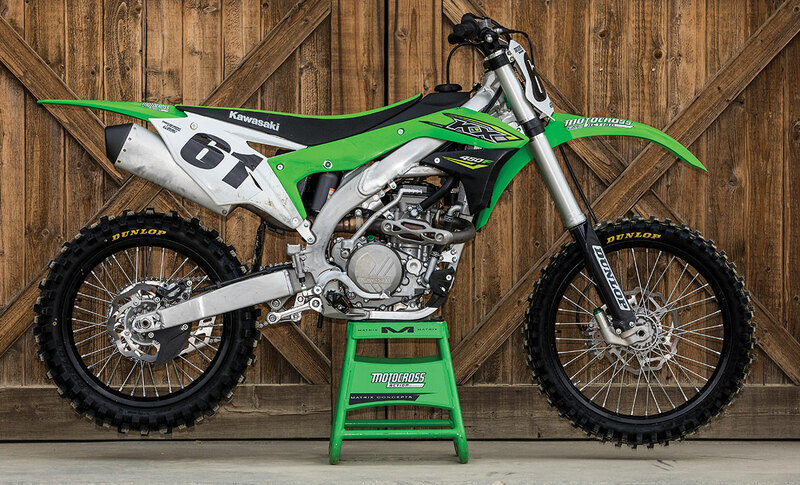 Of the “Big Four” Japanese brands, the 2018 Kawasaki KX450F is the Lone Ranger in spec’ing air forks. If there were any time in history not to have Showa TAC air forks on your bike, 2018 is it. Consumer resistance has killed the air fork, but Kawasaki didn’t get the memo. 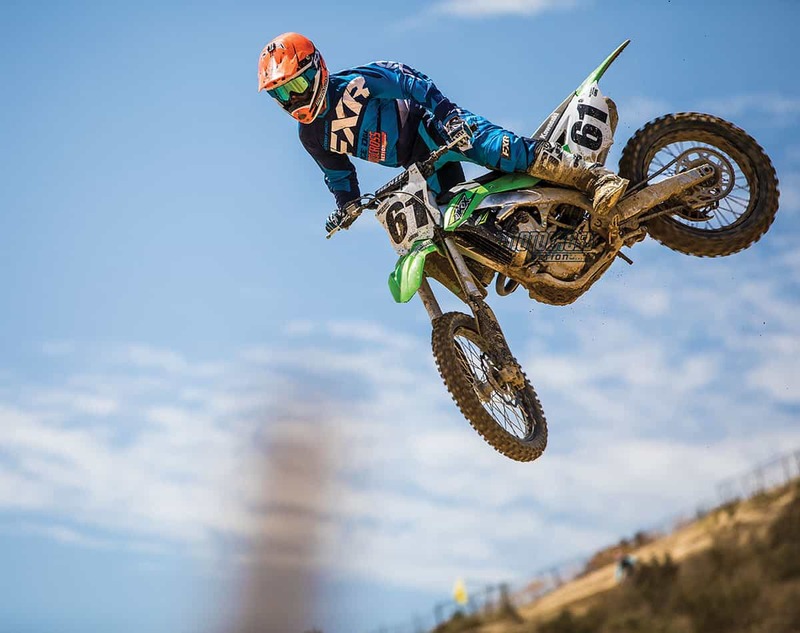 The anti-air brigade will avoid the 2018 Kawasaki KX450F in favor of bikes with coil-spring forks or WP AER air forks. That’s kind of sad, because we have really good settings for the KX450F’s TAC forks that few will ever get to use. (3) Clutch. The KX450F is pitiful. If you are a clutch user, it will slip in a couple of races. If you are a clutch abuser, it will slip after one moto. The inherent problem for Kawasaki in 2018 has very little to do with what could have been done to improve the KX450F, because Kawasaki chose not to do anything. We would have gladly accepted stiffer clutch springs, a better chain guide, new mapping and coil-spring forks. The timing is more to blame than the R&D department. If it weren’t for the hype over the all-new Yamaha YZ450F and Suzuki RM-Z450, Kawasaki might have slid under the radar. But the spotlight on the YZ450F and RM-Z450, even though neither turned out to be big hits, highlighted the lack of newness in the Kawasaki KX450F. Thus, it’s fifth. THE 2018 RM-Z450 IS A MAJOR REVISION OVER THE BIKE THAT SUZUKI HAS BEEN BAND-AIDING FOR YEARS. 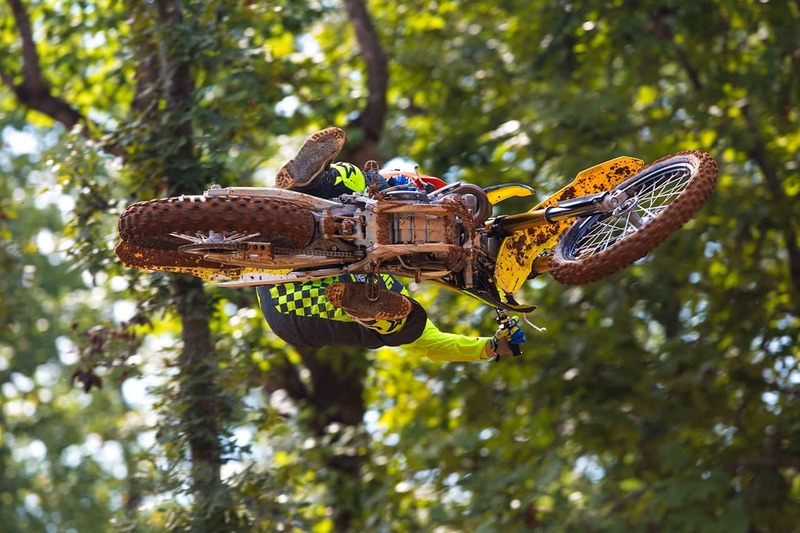 THE PARADOX IS THAT SUZUKI HAD MORE TIME TO THINK ABOUT WHAT THEY WOULD DO, BEFORE THEY FINALLY DID IT, THAN ANY MOTOCROSS MANUFACTURER IN HISTORY. 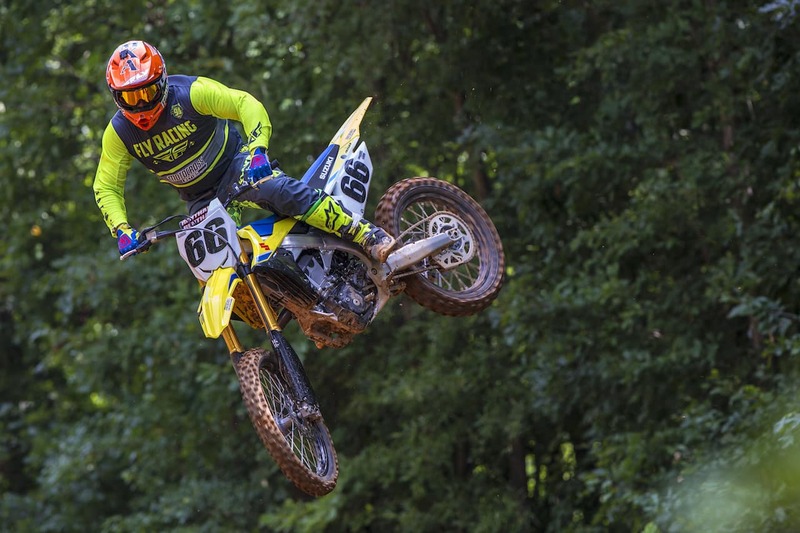 SIXTH PLACE: 2018 SUZUKI RM-Z450. The 2018 RM-Z450 is a major revision over the bike that Suzuki has been Band-Aiding for years. The paradox is that Suzuki had more time to think about what they would do before they finally did it than any motocross manufacturer in history‚ and what they did wasn’t worth the wait. This is a bike that will only sell to Suzuki loyalists, who are few and far between after a decade of benign neglect by Suzuki management. We think that given another year of R&D, Suzuki could have done much better. Most of the needed fixes could easily be handled on the assembly line and with some real-world testing. Before we get to the aspects of the 2018 Suzuki RM-Z450 that slid it into the sixth-place slot, here are some things that it does right (with caveats about how they could have been righted even more). First, every MXA test rider loved the powerband. It picked up cleanly off the bottom and got its job done in the rpm range where the typical rider likes his power. It has almost perfect power placement for the average rider. It’s not too fast and it’s not too slow. It’s just right for a rider looking for a manageable, no-drama, 450cc motocross powerband. There is better over-rev on top than in 2017, but by no means is this a top-end powerband. With all the changes Suzuki made to the 2018 engine (revised cylinder head, repositioned injector nozzle, increased fuel-pump pressure, reinforced piston, straighter air boot, realigned throttle body and an intake cam with more lift), we expected competitive horsepower numbers. Instead, we got 1 horsepower more at peak for a total of 55.16 horsepower. That is the least horsepower of any 2018 bike—as much as 3 horses less. Second, given that Suzuki spec’ed the worst set-up forks in the world in 2016 and 2017, anything would be an improvement. The RM-Z450 and 2018 CRF450 share the same basic Showa coil-spring fork. The result, on both the CRF450 and RM-Z450, is a fork that is very harsh in the small stuff and bottoms in the big hits. Believe it or not, on the Suzuki, this is a quantum leap better than what they had before. Third, the Suzuki has always been considered the best-turning bike in the sport—although not the best all-around handler. Suzuki can still claim to have the sharpest-turning bike—with the caveat that its unbalanced chassis will make it turn too sharp. It oversteers in and goes wacky on turn exit. The rear of the bike is too high, stinkbug-style, which steepens the head angle, especially under braking, and the result is a twitch-o-matic. To get the rear end down and the head angle back where it belongs, you have to resort to excessive race sag. That didn’t work because the RM-Z450 chassis needed us to go beyond the limits of sanity. Instead, we ran a longer shock link and added 10cc of oil to the forks. As with the 2018 Yamaha YZ450F, when you put all of your chips on turn-in at the expense of stability, you ruin 75 percent of the bike’s handling characteristics to get 25 percent improvement—not a trade that anyone would voluntarily make unless they were racing Supercross or on a smooth track with no bumps. Fourth, Suzuki spec’ed the innovative new Showa BFRC rear shock on the RM-Z450. This is a great shock when the rear wheel is hooked up, but a teeter-totter when the rear wheel breaks traction, bounces or rebounds. Most MXA test riders felt that the rear end of the RM-Z450 made big swings in its travel that weren’t warranted by the track conditions. Cool technology, bad execution. Fifth, riders always say that they don’t care how much their bike weighs because it feels light in motion. No 2018 Suzuki RM-Z450 owner will ever say that, because the 2018 RM-Z450 feels heavy every time you lean it into a corner, try to get it stopped or make quick side-to-side corrections in switchbacks. At 241 pounds (without electric start), Suzuki should be selling the RM-Z450 by the pound. Sixth, most of the clutches on Japanese bikes are marginal when compared to the hydraulic units on the KTM and Husky, but the Suzuki clutch is submarginal. 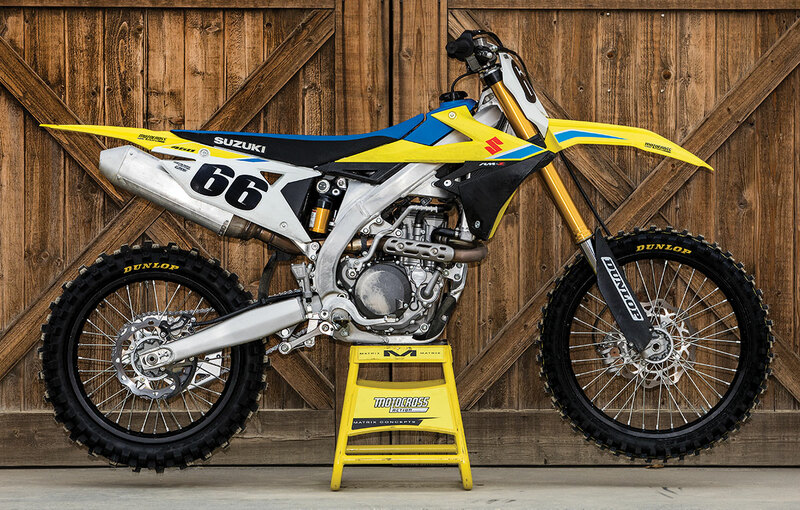 Suzuki took its time in building a totally new RM-Z450. Let’s hope the next redesign is coming in 2019. 2018 MXA 450 SHOOTOUT..THAT’S ALL FOLKS! 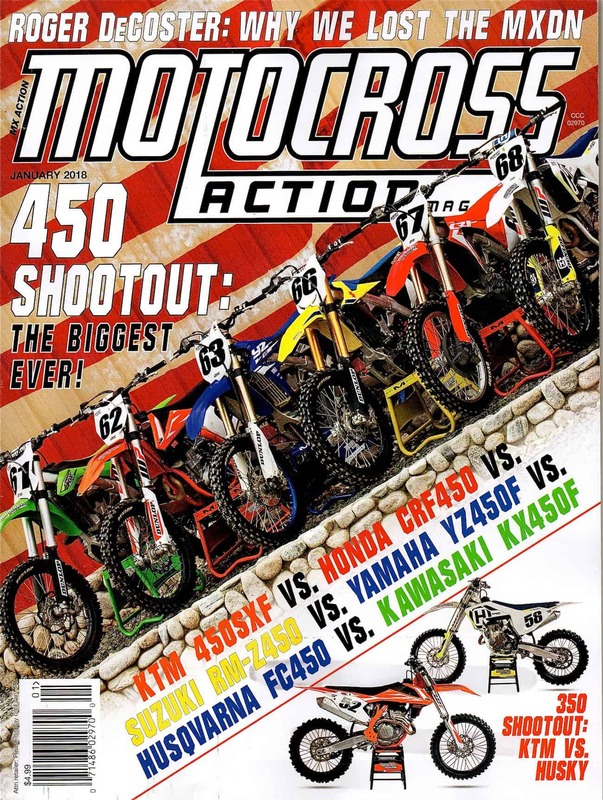 Had you subscribed to MXA, you would have read this complete shootout when it came out back in December. Click the box below to subscribe.